Looking to outfit your office with the perfect themed Texas office decor? As we do business in Texas with quiet determination and pride in the lone star state. We help you create that western themed office with Texas and western themed decorator accents. 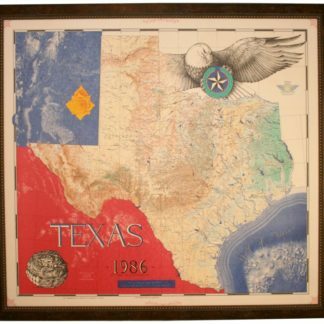 Consider our US made Texas rugs, old west inspired Texas furniture, and Texas art including western bronze sculptures, custom reclaimed wood framed Texas flags and historical Republic of Texas and physical framed Texas maps. Also, we offer a number of unique desktop items to let folks know where your heart is (in Texas). Choose from Texas made custom metal paperweights which can be personalized and exotic leather padholders for that special Texas event. For more details or to explore the full range of our Texas themed office decor items, click on any product picture below.